We even have a good shot at the best pizza outside of Italy. Fishtown alone has some of the city’s best spots – from Pizza Brain, to Pizzeria Beddia, to the handful of other small shops the neighborhood has been home to forever – I would say we are lucky enough to never have trouble finding a place close enough that they’ll deliver a quality pie to your door. Until recently, though, our city was not typically thrown into the mix when it came to the great pizza debate. 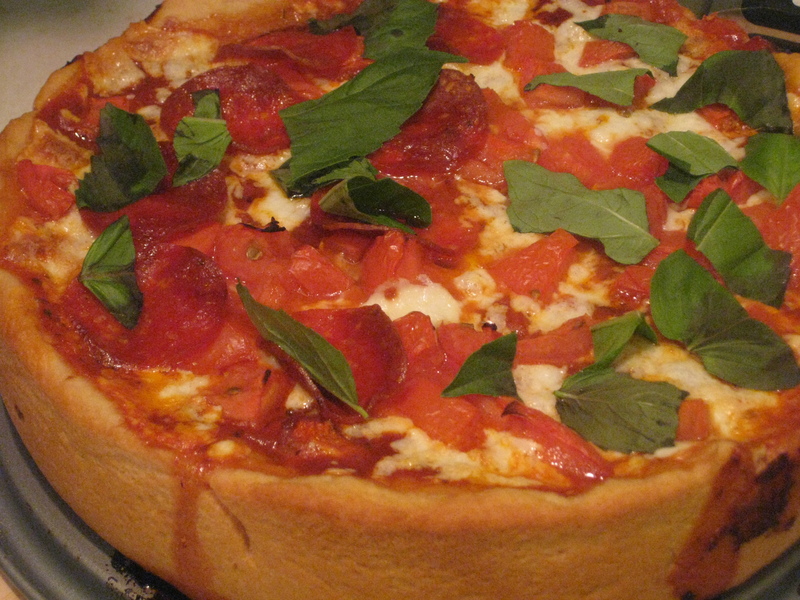 New York’s thin crust pizza and Chicago’s famous deep-dish pies will forever be the most popular pizza opponents. Residents of both cities take this competition very seriously and can’t even comprehend why one would choose the other. NYC’s style is similar to ours; easy to transport, it’s eaten with your hands and thin enough to scarf a couple of slices in order to be satisfied. Chicago’s pizzas are known to be more of a meal, and each slice is eaten with a fork and knife. To us that may sound laborious, but it’s practically necessary as the dough base practically envelops a ton of toppings, sauce and cheese. 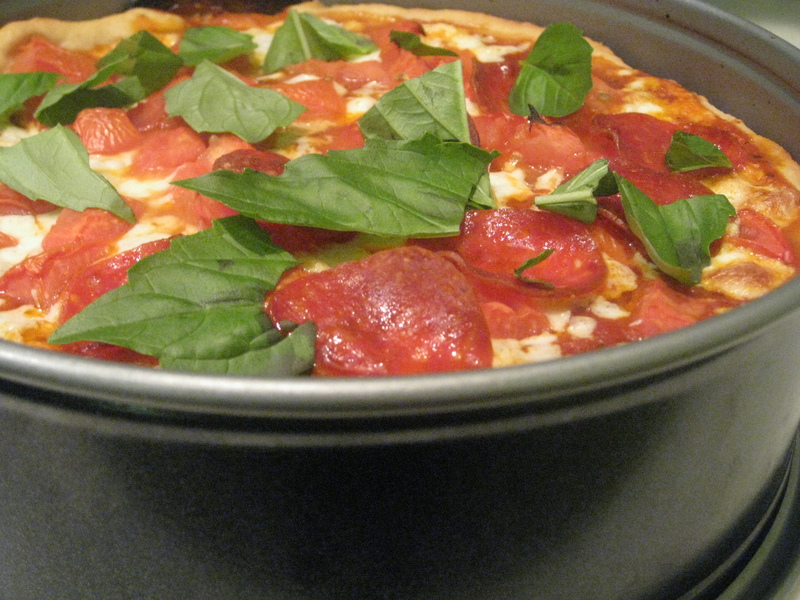 I’m an open-minded eater and felt that I had to try a deep-dish pizza in order to participate in the argument. Though I’d love nothing more than to board a plane and head to the “Windy City” my curiosity couldn’t withstand a plane ride. I had to try this one on my own. In a large bowl, combine the water, yeast, and sugar and stir to combine. Let sit until the mixture is foamy, about 5 minutes. Add 1 ½ cups of the flour, the semolina, ½ cup of the oil, and the salt, mixing by hand until it is all incorporated and the mixture is smooth. Continue adding the flour, ¼ cup at a time, working the dough after each addition, until all the flour is incorporated but the dough is still slightly sticky. Turn the dough out onto a lightly floured surface and knead until smooth but still slightly tacky, 3 to 5 minutes. Oil a large mixing bowl with the remaining 2 teaspoons oil. Place the dough in the bowl and turn to oil all sides. Cover the bowl with plastic wrap and set in a warm, draft-free place until nearly doubled in size, 1 to 1 ½ hours. Divide into 2 equal portions, and wrap one and freeze for later use. Preheat oven to 450 degrees Fahrenheit, and butter the bottom and sides of a 9” spring-form pan. Lightly flour a surface and roll out the half of the dough you are going to work with into a circle approximately 12” in diameter. Place into spring form pan, firmly pressing the bottom and making sure the dough comes approximately 1 ½” up onto the sides of the pan. Sprinkle 1 cup of mozzarella onto the bottom of the dough, top with one cup of sauce, then sausage followed by the mushrooms, then the other cup of sauce, tomatoes, cheese and pepperoni in that order. 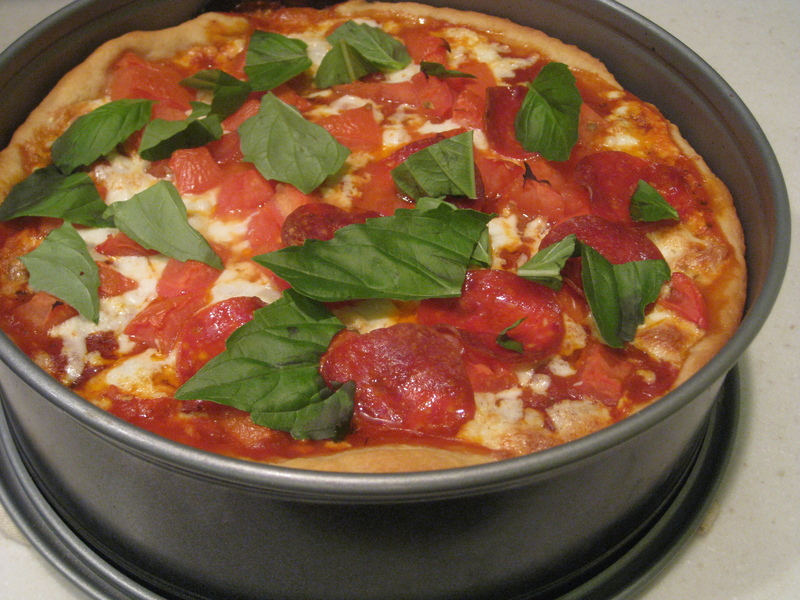 Bake for about 30 minutes, until the crust appears golden brown and top with fresh basil. Gently remove the sides of the spring-form pan and cut with a sharp knife in large wedges to serve. This dish is seemingly time consuming but truly takes no more time than a nice roast chicken dinner. The dough does require a good hour to rise, but in the process you’re also preparing some for another use so, I guess in a sense, you’re saving time for the future. The crust of the pizza is, in fact, on the thin side; however, the yeast addition makes it similar in texture to bread as opposed to a thin, crispy pizza we’re more familiar with. It’s a good thing, too – it does wonders housing the generous amount of toppings that are pretty much inside the pizza. The toppings are soaked in sauce without becoming soupy, as the top layer of cheese molds to the pizza under the heat of the oven. Though I love mushrooms, I may consider cooking them before adding them to the pizza next time: they produce a lot of liquid as they heat and, if anything were to contribute to any additional fluid, it would be them. On that note, the contents of the pizza are completely up to you – omit the sausage, add cooked spinach, use provolone. And, of course, you can use your homemade sauce recipe in place of jarred sauce. Whatever you do, make sure you use a fork and knife. The golden crust is the perfect base.